MANILA, Philippines - The 'super blue blood moon' on Wednesday, January 31, captivated the world with netizens and media sites shared their best and stunning photos of the rare phenomenon. The spectacle, which hasn't occurred since 1982, was the convergence of three celestial events: a supermoon, blue moon and total lunar eclipse. As observed, the moon turned orangish-red thus the 'blood' description. The next 'super blue blood moon' will happen in 2037. 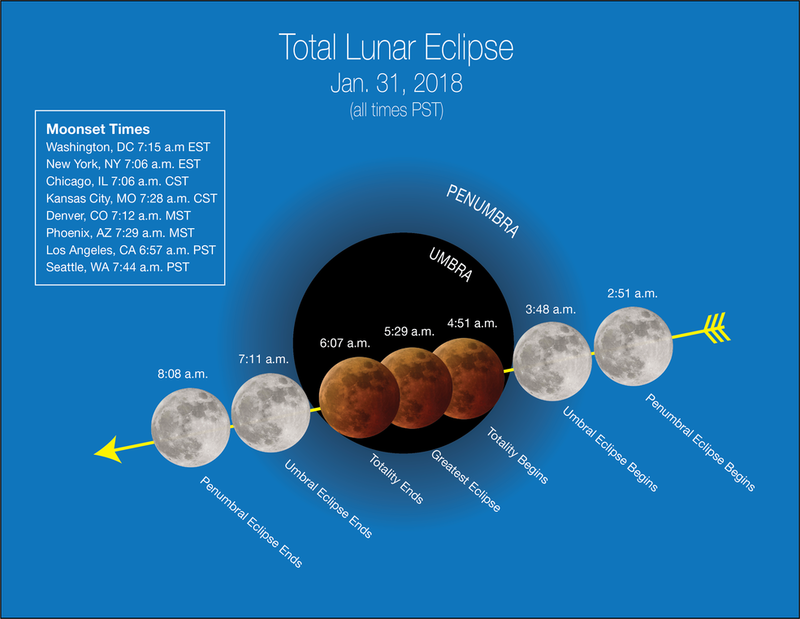 Penumbral eclipse began 6:49 PST, partial eclipse at 7:48 and the most awaited greatest eclipse at 9:29 p.m.
See below for the stunning photos of the Super Blue Blood Moon as shared across the web. Always incredible to witness something like this. Shoutout to everyone that pulled an all nighter to see this. MANILA, Philippines - January 31, 2018 brings a lunar trifecta: the super blue blood moon! The phenomenon is special for three reasons: it is the third in a series of “supermoons,” when the Moon is closer to Earth in its orbit -- known as perigee -- and about 14 percent brighter than usual. It’s also the second full moon of the month, commonly known as a “blue moon.” The super blue moon will pass through Earth’s shadow to give viewers in the right location a total lunar eclipse. While the Moon is in the Earth’s shadow it will take on a reddish tint, known as a “blood moon. State weather bureau PAGASA on their website confirmed that the Total Lunar Eclipse will be visible in the Philippines. "It is visible from western South America, North America, Asia, Australia, the Middle East, eastern Africa, eastern Europe, the Pacific Ocean, and the Indian Ocean." The eclipse will begin at 6:49 PM Philippine Standard Time (PST) and will end at 12:09 AM (PST) Feb 1. PAGASA said Lunar eclipses are safe to watch and observers need not use any kind of protective filters for the eyes. A binocular or telescope will help magnify the view and will make the red coloration of the Moon brighter. Meanwhile, a Blue Moon will light the sky on January 31 at 9:27 PM (PST). Since the lunar cycle is 29 days and most months have 30-31 days, we eventually find a situation where a full moon occurs at the beginning and end of the same month. An astrologer Richard Nolle coined the term supermoon over 30 years ago, but now many in astronomy use it as well. Richard Nolle’s definition, a new moon or full moon has to come within about 361,000 kilometers (224,000 miles) of our planet, as measured from the centers of the moon and the Earth, in order to be considered a supermoon. On January 31 at 9:27 PM PST, full moon distance will be 360,199 km. Excited to watch the rare 'super blue blood moon'? Tell us in the comments. 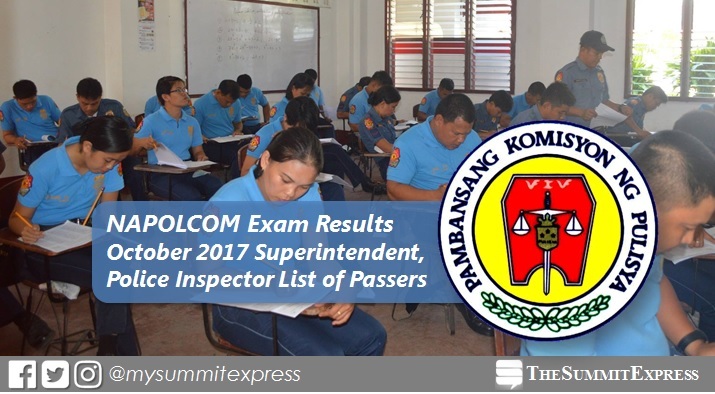 MANILA, Philippines - The National Police Commission (NAPOLCOM) on Monday, January 29, released full results of promotional exam, which includes list of passers for Superintendent and Police Inspector, conducted on October 22, 2017 in designated schools in Metro Manila and other testing centers nationwide. UPDATE: As announced, 43 passed in the Superintendent exam while 376 successfully hurdled test for Police Inspector. On January 15, results for PNP Entrance, Police Officer (PO) and Senior Police Officer (SPO) categories have been announced by NAPOLCOM Vice-Chairman and Executive Officer Atty. Rogelio T. Casurao. 17-10-0400260, TINGALA, KARL JEROME TINGALA. Takers may expect announcement of list of topnotchers in few days after the release of results for SUPT and INSP. Vice-Chairman Casurao said that the 33.44% passing rate in the promotional exams is 6.41% lower than the 39.85% passing rate in the previous promotional exams in the same category (April 23, 2017). Vice-Chairman Casurao said that the low passing rate in both exam categories may be attributed to the Commission’s continuous upgrading of standards on its police examinations in line with its sustained effort to professionalize the PNP by ensuring that only the most qualified PNP personnel are promoted in the police service. The list of successful examinees will be posted also at the 7th Floor, NAPOLCOM Central Office located at the DILG-NAPOLCOM Center, NAPOLCOM Bldg., EDSA Corner Quezon Avenue, West Triangle, Quezon City and in all 18 NAPOLCOM Regional Offices, and can be viewed at the NAPOLCOM website at www.napolcom.gov.ph. Individual report of rating will be mailed to all examinees. Verification of test results is being entertained at the NAPOLCOM central office and its regional offices nationwide. MANILA, Philippines - Tough Mudder, the world's best mud run, has arrived in the country! Sport and active lifestyle brand Tough Mudder, Inc. and sports agency Proactive Sports Management partnered to bring the world’s leading obstacle course event for the Filipinos. The announcement was made during the official launch on Saturday, January 27, at the Shangri-La at the Fort in Bonifacio Global City. The inaugural Philippine’s Tough Mudder Event Weekend will take place in July, followed by another event in November 2018. Both events will feature Tough Mudder’s signature obstacles. “This is the first time that Tough Mudder will be in the Philippines, and Tough Mudder is not just about being tough, it is also about teamwork and determination,” said Proactive COO Justine Cordero. 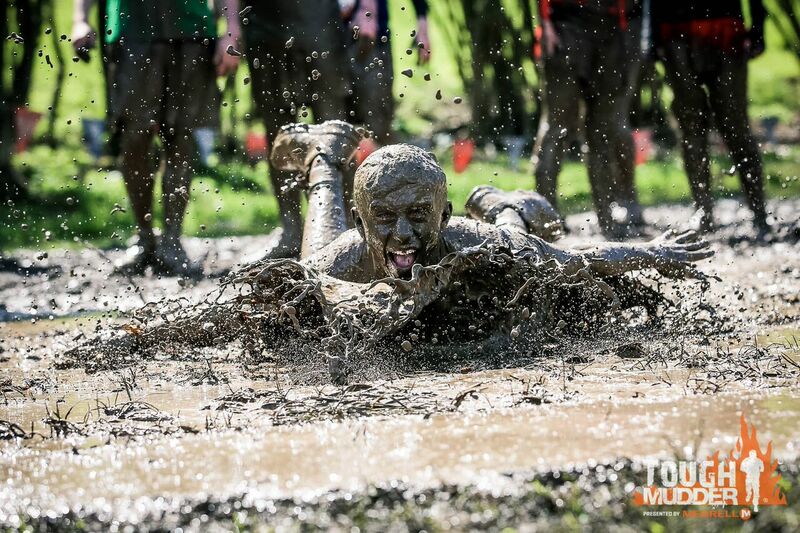 This new licensee follows the success of Tough Mudder’s licensed events – hosted to date in Mexico, Bali, Ireland, United Arab Emirates, and Australia. It will provide access to events for active lifestyle individuals living or visiting the Philippines seeking the challenge, camaraderie and thrills that only a Tough Mudder experience can offer. “Tough Mudder events have united millions seeking a more engaging, communal form of active lifestyle. We are excited to partner with Proactive Sports Management, who have a proven track record for success for athletic events in the Philippines, to ensure locals and tourists alike will have the same unparalleled experience that has made Tough Mudder the must-do event for OCR enthusiasts and weekend warriors alike,” said Will Dean, CEO and Co-Founder, Tough Mudder. With more than 3 million participants to date across five continents, Tough Mudder has offerings ranging from accessible yet rewarding challenges, such as the Tough Mudder 5K and Tough Mudder Half (five-mile event excluding fire, ice and electricity), to competitive events, such as Tough Mudder X (the toughest mile on the planet) and World’s Toughest Mudder (24-hour endurance event). This year, Tough Mudder, Inc. and its licensees will host an unprecedented 150+ events across nearly a dozen countries, such as the United States, The United Kingdom, Germany, Australia, United Arab Emirates, Canada and two new countries, South Africa and Oman, welcoming participants worldwide into a global community that lives courage, personal accomplishment, teamwork and fun. Registration for Tough Mudder in the Philippines is ongoing, for more information, check out Facebook/ToughMudderPhilippines. MANILA, Philippines - If you haven’t seen Kris Aquino’s new house, or don’t know the items she keep in her bags, you’re missing out! Since the Queen of All Media, including Social Media, has invaded YouTube with her channel, The Aquinos, Kris has gotten over 21 million views and close to 150,000 subscribers. And it’s not just Kris who’s catching up on how YouTube actually helps celebrities reach out to fans in a more personal way. Celebrities on YouTube are becoming a new trend, to the fans’ delight. Jolina Magdangal started her YouTube channel, Jolina Network, on her birthday last November, and also announced that baby number two is coming. Dr. Vicki Belo and Hayden Kho’s full wedding video has received over 100,000 views on Vicki Belo’s channel. Judy Ann Santos has taken on a new but very personal role with YouTube’s help -- a foodie sharing her culinary skills. In her most-watched video over Judy Ann’s Kitchen, Juday shows how to prepare red velvet ala mode with homemade ice cream and dulce de leche. Celebrities are also bringing out their inner gurus to YouTube to share a life hack or two. Solenn Heussaff dabbles on sharing tips on make-up, cooking and painting, and shares other fun videos that show a different side of her on her self-titled channel Solenn.ph. Michelle Madrigal’s channel, Michelle, has the former Star Circle Quest finalist sharing workout tips for moms to help them get fit and feel good about themselves even without a gym membership. From tips to everyday glimpse, celebrities are also sharing more and more about themselves without scripts and directors. The Ms. Alex Gonzaga channel catches precious spontaneous moments from Alex’s camera, some of them shared with sister Toni. So spontaneous are they that Alex gets surprised to see clips she didn’t remember taking. Alex considers receiving comments like ‘your videos made my day’ and ‘your videos are my stress reliever, thank you’ as one of the best compliments one can get as a celebrity. “I think with YouTube, people get to know me more and feel closer to me because I share what I do outside my showbiz career,” said Alex. Celebrity moms are also making the most out of YouTube. And while Scarlet Snow Belo is a superstar on YouTube and other social media platforms, mom Vicki reveals she has other uses for YouTube. “I love how YouTube helps me when I look for information, and of course now that I have Scarlet, most of my searches are her favorite cartoons,” she said. From old timers to recently opened channels, different stars are doing their own thing over YouTube. Michael V’s channel, #BitoyStory, is just over a month old with four videos but already his subscribers are more than 100,000 and his views are over a million. Mikael Daez, Xian Lim, Elissee Joson, Kristel Fulgar all have their own channels too, which they started way ahead of the pack, from 2011 to 2015. More and more celebrities are going on YouTube, and for good reason. YouTube is where they can explore their passion apart from showbiz and share them with a wide range of people, and be closer to their fans in a very real and personal way. MANILA, Philippines - (Updated February 12) The National Police Commission (NAPOLCOM) opens today, February 5 the Online Exam Application Scheduling System (OLEASS) for the applicants of April 22, 2018 (Sunday) PNP Promotional Examinations. See online application form link here. UPDATE: Online Scheduling for the PNP Entrance Examination has ended. For those who successfully registered but failed to print their Confirmation Letter and want to access their Application Form, a QUERY/VIEW facility is available here. The PNP Entrance exam is open to all Filipino citizens who meet the age and educational requirements. Check out details of classifications here. UPDATE: NAPOLCOM Vice Chairman Rogelio Casurao on Friday, January 19 said height requirement has been removed starting with the April 22 police examinations. “Starting with the April 22, 2018 police examinations, there shall be no height requirement for the Philippine National Police (PNP) entrance exam applicants as long as they are bachelor’s degree holder and not more than 30 years old,” the statement read. Applicants were previously required a height of 1.57 meters for female and 1.62 meters for male. 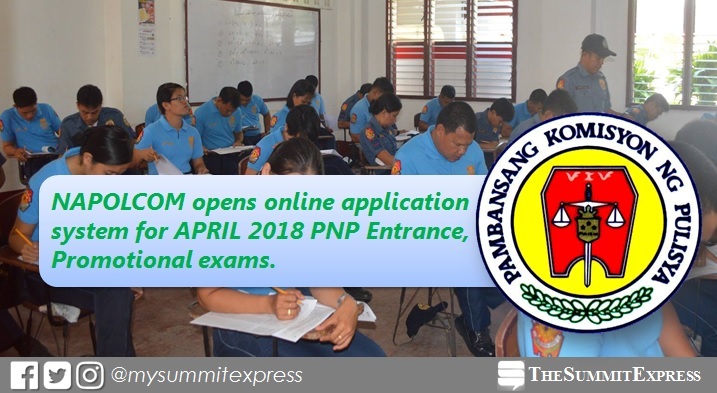 Meanwhile, PROMOTIONAL EXAMINATIONS are open exclusively to all qualified uniformed members of the PNP who meet the minimum qualification standards for examination in terms of rank and eligibility. It covers exams for Police Officer (PO), Senior Police Officer (SPO), Inspector (INSP) and Superintendent (SUPT). View here the classification standards. 4. Check your e-mail account and access the link for the Application Form. Fill in all the required details, click SUBMIT and PRINT OUT a hard copy. NOTE: Only applicants with printed confirmation letter and filled-out electronic exam application form shall be entertained at the NAPOLCOM Regional Offices during their scheduled appointment date. The period of filing of application is from February 19 to March 19, 2018. NAPOLCOM OLEASS page as activated on Monday, January 29. Once you've given the green light to take the examinations, the next thing after taking the exam is to wait for the NAPOLCOM results. We advise examinees to closely monitor The Summit Express and our social media pages Facebook and Twitter for the updates. MANILA, Philippines - Despite his age, Lolo Pedro Lachica dominated the dance floor and shocked judges in the audition for the sixth season of "Pilipinas Got Talent" (PGT) on Sunday, January 28, 2018. The unexpected and witty performance of the 52-year-old single-father inspired all with the judges gave him standing ovation and four yeses without lengthy remarks. The amazing 'lolo' made them speechless. MANILA, Philippines - Film and TV director Maryo J. Delos Reyes died on Saturday evening, January 27. He was 65. Photo Courtesy of Direk Maryo J. Delos Reyes Facebook page. Jun Rufino, Delos Reyes' manager confirmed the news saying that the blockbuster director passed away around 10 p.m. after suffering a heart attack while attending a party with a friend in Dipolog City. “We have loved him in life, let us not forget him in this time of sorrow," Rufino said. ABS-CBN reporter MJ Felipe also shared on social media the details of the sudden demise of the showbiz personality. 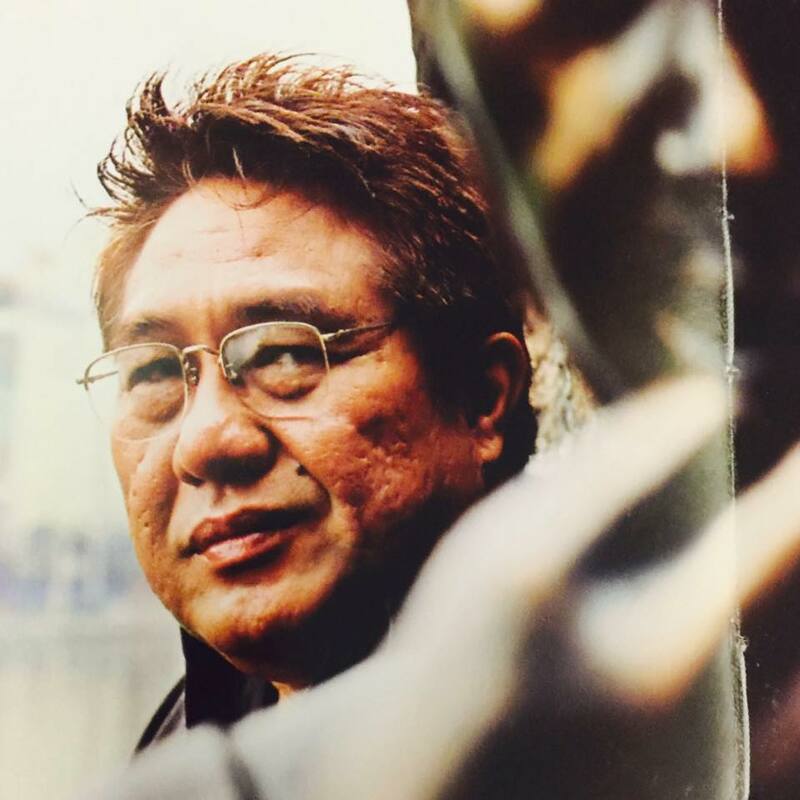 THIS JUST IN: Film and TV Director Maryo J Delos Reyes has passed away around 10pm this evening January 27. Direk Maryo’s team and his manager June Rufino confirmed this news. Initial info: Direk Maryo suffered a heart attack while attending a party in Dipolog City with a friend. READ: Statement of June Rufino - “It is w/ deep sadness that we inform everyone that our beloved Maryo J. Delos Reyes passed away at 10pm January 27, 2018. Details of his wake and funeral services to follow. We have loved him in life, let us not forget him in this time of sorrow. Celebrities and friends in the industry pour their tribute online. Rest In Peace, Maryo J. Delos Reyes. Rest in peace Direk Maryo. Found out last night thru my nurse friend in Dapitan but kept quiet hoping it wasn’t true. Direk Maryo was my first script teacher in UP. I also first experienced real shooting when we visited him on the set. I remember him as gentle and very generous. Among the notable films Delos Reyes directed were "The Unmarried Wife," "Magnifico," and "A Love Story." MANILA, Philippines - (Updated January 28) RESULTS ARE OUT! The University of Santo Tomas (UST) Office for Admissions (OFAD) released the UST Entrance Test (USTET) results for Academic Year AY 2018-2019 early Sunday, January 28, 2018. USTET 2018 was administered by OFAD on November 20 and December 3, 2017 at the UST campus. 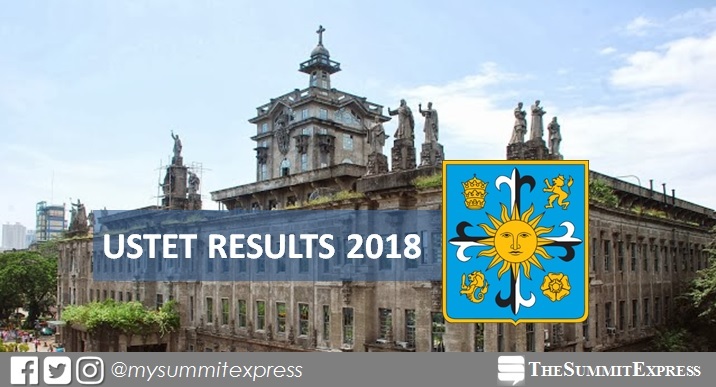 The complete results - list of passers will be available at http://myuste.ust.edu.ph:8888/admission/results.jsp, where examinees can log-in and view if examinee passed the test. Screenshot of USTET results page. "You can view your USTET results starting January 28, 2018. However, you can only view the results of the program/strand you applied for," UST said. OFAD further advised takers that hard copy will no longer be provided. "You may download and print your results for presentation purposes during the Confirmation of Enrollment." Admission in UST is based on applicant's high school academic performance (40 percent of the applicant’s total score) with the remaining 60 percent will come from USTET results. Payment of reservation fee for qualified applicants is from January 29 to February 9, 2018. "Please check dates indicated in your USTET results." UST is one of the best education institutions in the Philippines and the largest Catholic University in the World in terms of student population in a single campus. It has the most number of accredited programs according to PACUCOA. MANILA, Philippines - The finger-tutting performance of Reconnect group from Cavite wowed on the sixth season of "Pilipinas Got Talent" (PGT) on Saturday, January 27, 2018. Reconnect received four yeses from the judges. "I find it so genius," Vice Ganda commented. "Ang galing, parang walang imposible, lahat magagawa," Robin Padilla said. "Extraordinary performance. Ngayon lang ako nakakita ng ganyan. Impressive," Angel Locsin added. "You improved what you saw on YouTube," Freddie Garcia said. Finger-tutting is a type of dance that involves intricate movements of the fingers. The word "tutting" is a street dance style based on angular movements which are supposed to stylize the poses seen on reliefs in the art of ancient Egypt, and refers to "King Tut." It received international attention after dancer/choreographer Julian "JayFunk" Daniels performed in a viral Samsung commercial entitled "Unleash Your Fingers." MANILA, Philippines - The Luzon Spine Expressway Network is Duterte administration’s answer to help decongest the traffic in Metro Manila and busiest parts of Luzon. The Philippines has one of the worst traffic in the world. Under President Rodrigo Duterte’s “Build, Build, Build” program, the Department of Public Works and Highways (DPWH) was tasked to build an expressway that would connect the northern and southernmost part of Luzon. The Luzon Spine Expressway is a 1,040 km network that aims to build an additional 18 expressways with a total road length of 655 km. It would then connect to the existing 12 expressway network spanning 385 km. DPWH Secretary Mark Villar hopes that the new high standard highways will significantly ease the traffic and cut down travel time. Once the ambitious project is completed, the travel time from Metro Manila to San Fernando, La Union will be reduced from six (6) hours and 55 minutes to three (3) hours and 10 minutes. La Union to Bicol travel time will also be reduced from from 19 hours and 40 minutes to eight (8) hours and 15 minutes. The NLEX Harbor Link Project is a 5.7 km expressway, which traverses Karuhatan in Valenzuela City, Governor Pascual Avenue in Malabon City, and C3 road in Caloocan City. The Central Luzon Link Expressway (CLLEX) is a 30-km expressway, which runs through the municipalities of La Paz, Zaragosa, Aliaga, and Caalibangbangan, to connect Tarlac and Cabanatuan. The Tarlac-Pangasinan-La Union Expressway (TPLEX) 3rd section is a 25.83 km expressway which extends the existing 63.02 km alignment traversing Tarlac, Rosales and Urdaneta to Binalonan, Pozzurobio and La Union. The NLEX-SLEX Connector Road, an 8 km four lane expressway that will reduce travel time from NLEX to SLEX from 2 hours to only about 20 minutes. The Metro Manila Skyway Stage 3, a 14.8 km, 6-lane expressway which will connect Balintawak in Quezon City to Buendia Makati. This will significantly ease traffic in EDSA especially during peak hours. In the next six years, Sec. Villar confirmed that the Build, Build, Build program costs P8.4 trillion. The Duterte administration has allocated DPWH the second biggest budget this year, amounting to P428 billion. From that, traffic decongestion programs were granted the biggest chunk of P107.8 billion. Second biggest budget is project on liveable, sustainable and resilient communities with P104.4 billion. While P95.9 billion goes to the integrated and seamless transport system. A budget of P18.8 billion goes to convergence and rural road development program. The UN agency posted on Twitter the simultaneous earthquakes and volcanic eruptions in four countries last Tuesday. In the Gulf of Alaska, a powerful earthquake with a magnitude of 7.9 led to a tsunami alert. In Japan, the eruption of Mount Kasatsu-Shirane killed one person and injured at least 11. Java, Indonesia was also struck with a magnitude 6 earthquake. 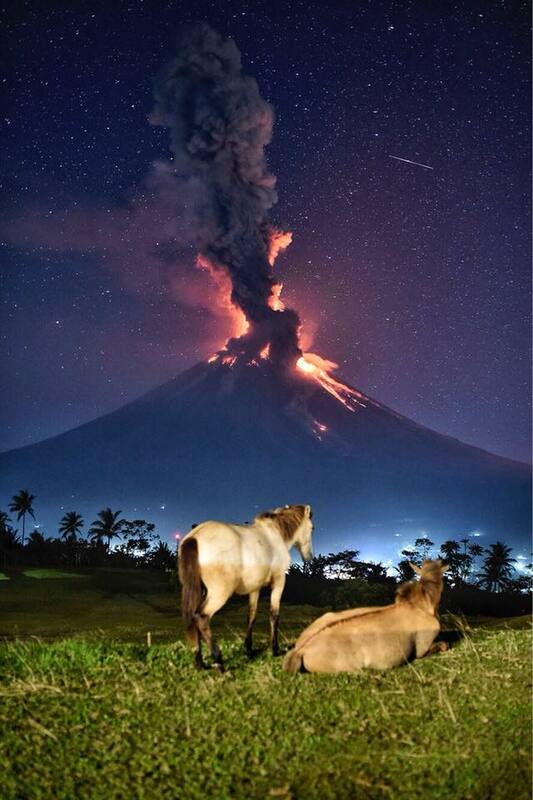 Mayon Volcano in Albay continues to spew lava and ashes. 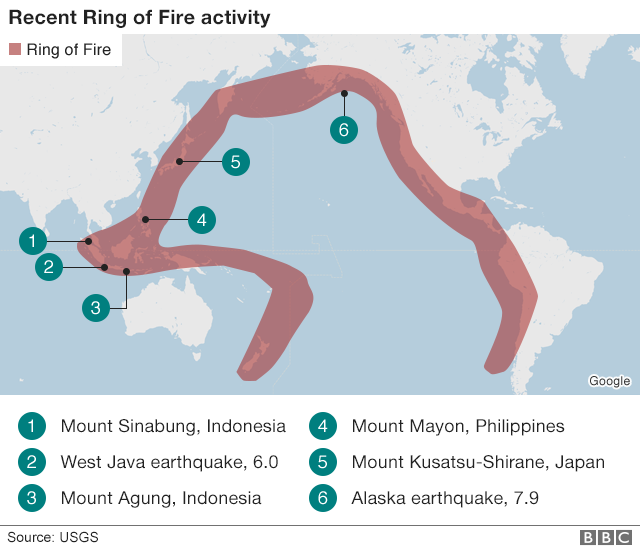 The Pacific Ring of Fire is a term used to describe a major area in the basin of the Pacific Ocean where a large number of earthquakes and volcanic eruptions occur. It runs from New Zealand, all the way to the West Pacific through the Philippines, Japan and Indonesia, extending all the way to the West coasts of North America and South America. Why monitoring the Ring of Fire important? The Pacific Ring of Fire accounts for 452 volcanoes which is 75% of all active and dormant volcanoes worldwide. About 90% of the strongest volcanic eruptions and approximately 81% of the world’s most damaging earthquakes have taken place along the Pacific Ring of Fire. As volcanic eruptions and earthquakes rumble in the Pacific Ring of Fire, some experts and scientists discuss on whether or not there is a reason to panic. Prof Chris Elders, a geology expert from Curtin University in Australia, says the recent activity is “entirely normal”. Dr Janine Krippner, a New Zealand volcanologist also agreed and noted that the rate of eruptions around the Pacific Ring have “not recently increased." 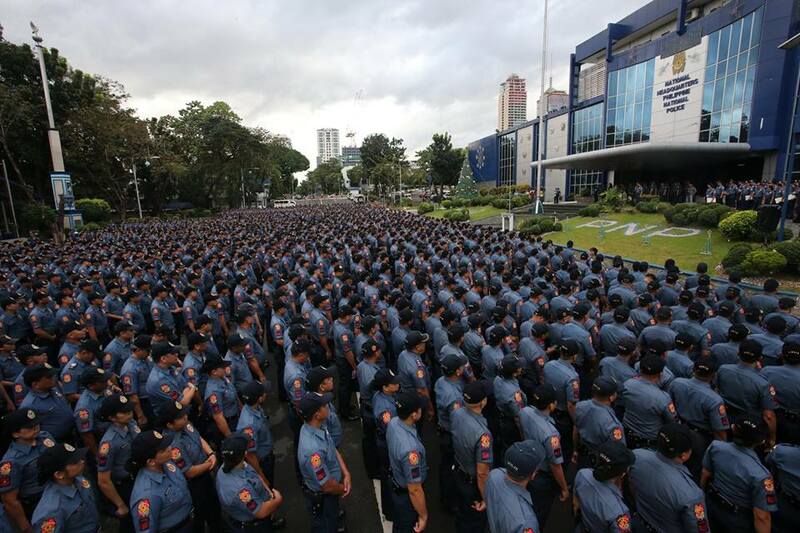 MANILA, Philippines - The National Police Commission (NAPOLCOM) clarifies that the removal of the height requirement is only for the purpose of taking the PNP Entrance Examination, and not for PNP Recruitment purposes. "The requirements for taking the PNP Entrance Examination are distinct and separate from the general qualifications required in the recruitment of qualified applicants for Police Officer 1 (PO1) which include the height requirement of at least 1.62 meters for male and 1.57 meters for female," NAPOLCOM said in a statement. The NAPOLCOM emphasizes that taking and passing the PNP Entrance Examination is not a guarantee for automatic entry into the police force. Only those who possess the general qualifications specified under Section 14 of Republic Act No. 8551 are qualified for appointment as member of the PNP. To set the record straight, the Commission reiterates that the removal of height limit applies to examination purposes only, and not to police recruitment as reported by some media entities. Height requirement is still included in the set of basic qualifications of the PNP that must be complied with by qualified applicants who aspire to become police officers. NAPOLCOM will open the online exam application scheduling system (OLEASS) for April 2018 PNP Entrance Examinations starting January 29, 2018. See full details and schedule here. A 17-feet dead whale shark was washed ashore in the Barangay Lobbot, Dipaculao, Aurora on Wednesday, January 24. The people of the Brgy. Lobbot had gathered around the shoreline after a huge shark was found lying. A post by Provincial Fisheries of Aurora had confirmed the incident but have yet to give more details including the great white shark’s cause of death. Great white is known to be the largest predatory fish on Earth. They grow to an average of 15 feet in length and weigh up to 5,000 pounds. The great white’s moniker is “ragged-toothed,” for its 300 serrated, triangular teeth. They also have an exceptional sense of smell that they can easily detect a drop of blood in 25 gallons of water. These species of sharks like many others, now face different ecological challenges. The International Union for Conservation of Nature listed the great white shark under the “vulnerable species.” Several nations such as Australia already made actions for their protection. They usually live in almost all coastal and offshore waters mostly in United States, South Africa, Japan, Oceania, Chile and Mediterranean. In the Philippines, we also have our own share of sharks sightings. Two destinations are known for shark diving in the Philippines. The thresher sharks can be seen at the Malapascua Island. While in Donsol, you get to swim with the thought to be largest congregation of whale sharks in the world. MANILA, Philippines - JM de Guzman gave a no holds barred interview on ABS-CBN's magazine show Rated K to open up about the drug abuse problem he had been battling. The 29-year-old actor admitted that at first he actually thought taking illegals drugs was helping him become a good actor. He said, “Akala ko nakakatulong siya sa akin as a person, as an actor at first. Taking drugs parang gives me power." De Guzman admitted he started using when he was 18 years old, “Parang na-excite lang ako na may something na di ko pa nagagawa. Eventually, kapag hindi na naano yung need mo na high, paiba ka nang paiba ng drugs. Nawalan na ng epekto, so parang naapektuhan ka na rin sa pag-iisip." De Guzman later realized he had unresolved issues within himself, "Pero noong nag-rehab ako, nabuhay sa akin na I have issues since I was a kid. I was bullied before when I was really young, so wala na akong self-esteem and confidence at that time." His showbiz career began in 2009 when he started getting cast in ABS-CBN teleseryes. De Guzman started with “Precious Hearts,” “Mula sa Puso” until he was given his biggest break in “Angelito: Batang Ama.” In the latter, the show was cut short and his character had to be killed because the actor’s condition was getting worse. "Parang di ko na maiangat yung sarili ko. Wala na. Yung paranoia ko, hallucinations ko, di na ako makagalaw pag walang drugs.” The actor finally agreed to enter a rehab facility. After 11 months, De Guzman finished the rehab and went back to making two hit projects — “That Thing Called Tadhana” and “All of Me.” But sadly, he had a relapse and went back to rehab. This time, he was forced to confront his issues and not take the easy way out again. De Guzman said, "Inactingan ko sila, pero di nakalusot sa kanila, so talagang naproseso yung issues ko sa loob, isa-isa." Looking back, the Kapamilya star described how drugs took hold of his life, “So kukunin niya rin self-respect mo and yung pagmamahal mo sa sarili mo." Rumors of a “That Thing Called Tadhana 2” had been circulating after Angelica Panganiban posted a photo of them together.